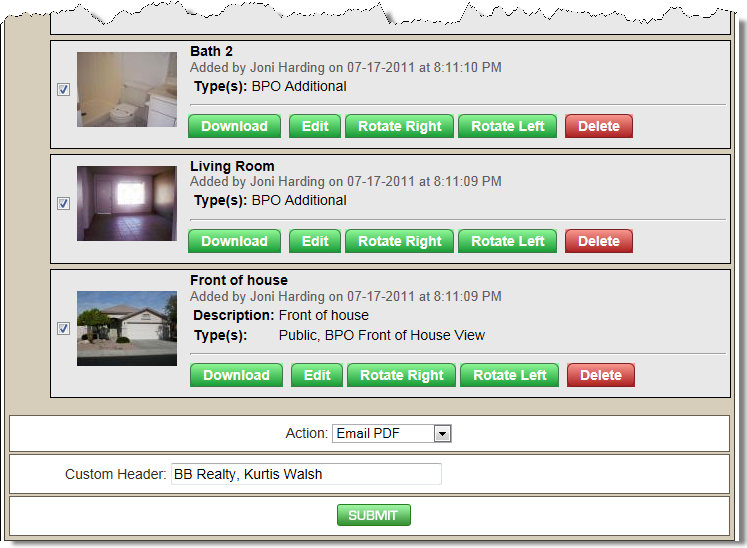 This section will define the process for downloading a property photo that has previously been loaded into Broker Brain. If you are looking to bring a new property photo into Broker Brain, see the section called Uploading Photos into Broker Brain. 2. Once you have located the property, click on the Photos sub tab at left. 3. Locate the photo you wish to download. 4. Click the green Download button. You will be prompted to Open or Save the file. Follow the standard process you use when you download any file to your system. 3. Locate the photo(s) you wish to download. Place a check mark next to each or select the Check/Uncheck All box located directly above the photo list. 4. Select an option from the Action drop-down menu at the bottom of the screen. There two Download options: Download PDF and Download Zip. When the PDF option is chosen, a PDF very similar to the Photo page(s) in a BPO report will be generated with the photos that you selected, and either emailed or made available to download. When the Zip option is chosen, a zip file with all of the separate photos will be either emailed or made available to download. 5. In the Custom Header field, type in whatever header should appear on PDF files. 6. Click the Submit button. You will be prompted to Open or Save the file. Follow the standard process you use when you download any file to your system.